South African artist William Kentridge (b. 1955) is internationally-recognized for his film, drawing, sculpture, animation, and performance. For more than three decades, his work has explored contentious political systems such as colonialism, totalitarianism, and apartheid through powerful allegorical imagery and theater. At the core of his artistic practice is the pleasure of putting pieces together, and a belief in the primacy of process over facts. William Kentridge: Tango for Page Turning features a stop-motion animated film created as part of the artist’s multimedia chamber opera, Refuse the Hour (2012). Conceived in collaboration with composer Philip Miller and choreographer Dada Masilo, the opera explores the meanings and implications of standardized time. Tango for Page Turning was also one component of Kentridge’s acclaimed 5-channel video installation, The Refusal of Time, shown in 2014 at the Metropolitan Museum of Art, among other major venues. 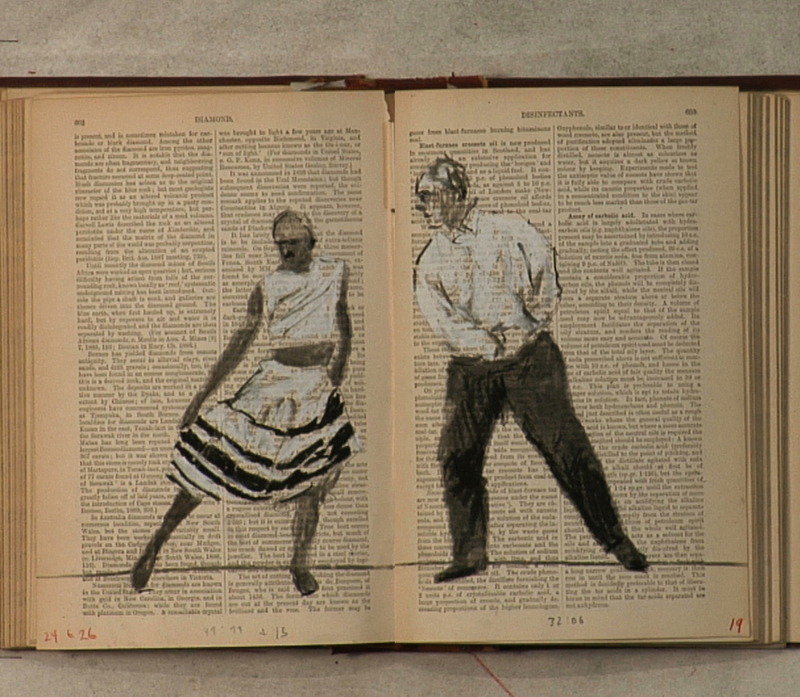 In Tango for Page Turning, animated figures depicting Kentridge and Masilo dance across the pages of an antiquated chemistry book. The soundtrack is a head-spinning mash-up of sung words and phrases from Le Spectre de la Rose by composer Hector Berlioz, a musical composition set to poetry by Théophile Gautier. As each sketched and photographed frame gives way to the next, the film trembles before our eyes, reminding us not only of Kentridge’s painstaking animation process, but of the nature of time itself. Tango for Page Turning is the inaugural acquisition of the New Media Arts Consortium, a collecting collaborative of the art museums at Bowdoin College, Brandeis University, Colby College, Middlebury College, Mount Holyoke College, and Skidmore College. This exhibition is made possible by the Lucy P. Eisenhart Fund.